What Accounts for the Electoral Victories of France’s Neo-Fascist National Front? The municipal elections in France have laid bare the political crisis in France and Europe as a whole and the dangers facing the working class. The political beneficiaries of the discrediting of the bourgeois “left,” represented in France by the Socialist Party (PS) of despised President François Hollande, are neo-fascist parties such as France’s National Front (FN). Amid a record abstention rate of 38.5 percent, the FN advanced to next Sunday’s run-off elections in 229 of the 600 cities where it ran slates. The FN’s Steeve Briois won outright in the first round in Hénin-Beaumont, located in the former coal basin in northern France, which was devastated by PS mine closures in the 1980s. 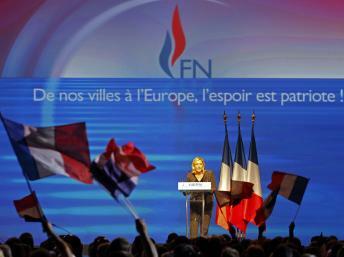 The FN also came in first in 17 cities of over 10,000 people. These include Forbach, where its list got 36 percent of the vote, Fréjus (40 percent), Béziers (45 percent), Perpignan (34 percent), and Avignon (30 percent). The FN came in second in Marseille, France’s second largest city, behind incumbent Jean-Claude Gaudin of the right-wing Gaullist Union for a Popular Movement (UMP). The FN doubled its vote in Paris, where temp workers protesting poor working conditions attacked the headquarters of PS mayoral candidate Anne Hidalgo. In a move with far-reaching consequences, sections of the French ruling class are reacting to the collapse of popular support for the PS by pushing to fully integrate the FN into official politics. FN leader Marine Le Pen predicted “the end of the two-party system” of the PS and the Gaullists and the rise of the FN. “The French people have liberated themselves from the false choice between the right and the left,” she said. The FN can appeal to social discontent only due to the reactionary role of the pro-business PS and petty-bourgeois pseudo-left groups such as the New Anti-capitalist Party (NPA), which work to suppress all political opposition in the working class. The FN is increasingly seen as a “normal” party, particularly since Hollande’s election in 2012, because parties such as the PS and NPA are themselves rapidly shifting towards far-right policies. While imposing wave after wave of social cuts and tax breaks for business, the PS has turned to fascistic appeals. Last year, as the PS government carried out military interventions in Mali and the Central African Republic and pushed for war in Syria, PS officials admitted that one calculation was the hope that a quick, victorious war would boost Hollande’s poll ratings. Interior Minister Manuel Valls, meanwhile, ominously called for the entire Roma people to be removed from France. The NPA, which called for a vote for Hollande in 2012 while cynically acknowledging that he would adopt reactionary policies, has not sought in any way to develop opposition to the PS. Deeply integrated into the bourgeois media, the trade union bureaucracy and sections of academia close to the PS, this organization and similar pseudo-left groups are not seen by workers as fighting for power, let alone for socialism—which, indeed, they are not—but as integral components of a discredited political establishment. These are not left-wing parties seeking to rally working class opposition to the PS or FN. They are right-wing organizations that can barely distinguish themselves from Hollande and the Socialist Party. They speak for well-off sections of the middle class that seek to preserve their privileges by blocking the eruption of class struggles that would undermine the PS. One demonstration of the hypocrisy of the NPA’s criticisms—increasingly tepid—of the FN is the fact that it is hailing as a democratic revolution last month’s putsch led by the FN’s ally in Ukraine—the neo-fascist Svoboda party. The critical issue in the fight against fascism is the unification and mobilization of the working class in France and internationally in revolutionary struggle against capitalism. While there is deep hostility to fascism in the working class, this opposition can be rallied only if the advanced workers are armed with a socialist perspective. This requires a ruthless struggle to reveal the class gulf separating the struggle for socialism based on the political heritage of Trotskyism from the reactionary, bourgeois politics of the pseudo-left. These forces have for decades proceeded from the bankrupt perspective of the “Union of the Left,” on which basis the French Internationalist Communist Organization (OCI) broke with the International Committee of the Fourth International (ICFI)—the world Trotskyist movement—in 1971, three years after the 1968 French general strike. The OCI sought to work with all of the “left” parties, ostensibly to push the newly-formed PS and the Stalinist Communist Party (PCF) to the left. In the process, the OCI became an instrument of the PS—itself an electoral vehicle for François Mitterrand, a former official of the World War II Nazi collaborationist Vichy regime. After his election in 1981, achieved in alliance with the PCF, Mitterrand reacted to rising budget deficits and capital flight organized by the banks by abandoning his limited reform program. He mounted an “austerity turn,” slashing social spending and dismantling uncompetitive industries that had been bastions of working class radicalism after 1968. In a move whose reactionary implications are becoming ever more clear, Mitterrand held onto power in the 1980s and 1990s despite rising social anger by boosting the FN’s media profile and using it to divide the right-wing vote. Nonetheless, the OCI and other pseudo-left forces continued to support the PS social democrats. After the 1997-2002 PS-led “Plural Left” government of Prime Minister Lionel Jospin had discredited itself with its austerity policies, Jospin was eliminated from the second round of the 2002 presidential election by UMP incumbent Jacques Chirac and then-FN leader Jean-Marie Le Pen. This left the working class with a “choice” in the second round of voting between the right-wing Chirac and the ultra-right Le Pen. Though they had received a combined 11 percent of the vote in the first round of the election, the Revolutionary Communist League (LCR)—the predecessor of the NPA—Workers Struggle (LO), and the Workers Party (formerly the OCI) did not seek to mobilize the working class against an election that was widely seen as illegitimate. Instead, they lined up behind calls to elect Chirac, claiming this would halt the rise of fascism in France. They rejected the ICFI’s call for an active boycott of the presidential election as the basis for developing an independent political movement of the working class against the social attacks and wars that were certain to come under a reelected Chirac. Events in the ensuing decade totally vindicated the policy advanced by the ICFI. The lineup of the pseudo-left parties behind a right-wing president proved to be a turning point in their further evolution to the right and into the camp of bourgeois politics. The central question in France and throughout Europe is the construction of revolutionary parties as sections of the ICFI. This is the key to preventing the pseudo-left forces from subordinating the working class to the bourgeoisie, paving the way for greater social defeats and attacks on democratic rights, either directly at the hands of FN or through the adoption by the entire political establishment of its policies.